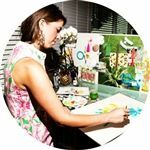 When Paige Smith was in Junior Kindergarten at Brookside Lower School, her teacher sent home a note saying, “Paige spends most of her time in the paint corner or playing dress-up.” Smith now gets to do both every day through her work as a print designer for Lilly Pulitzer, located just outside of Philadelphia. Known for their vibrant, colorful prints, Lilly Pulitzer has been an iconic name in the fashion industry ever since Jacqueline Kennedy was first seen wearing a “Lilly” in the ‘60s. While technology has changed since then, the way Lilly Pulitzer creates their designs has not. “We paint everything by hand,” says Smith, who went on to attend the Savannah College of Art and Design. Smith is comfortable sharing and critiquing her work with Pulitzer’s six other designers because she’s been doing it since her days at Kingswood.